The subterranean Skullcrawlers plagued the inhabitants of Skull Island. Viciously attacking and eating the other denizens of the island, including other Kongs, the beasts stalked the landmass. Their viciousness could actually be attributed to their hypervore nature, as it has such a high adrenalized metabolism that it quickly burns energy to place it in a state of starvation. This leads to the creatures seeking out mass amounts of food. 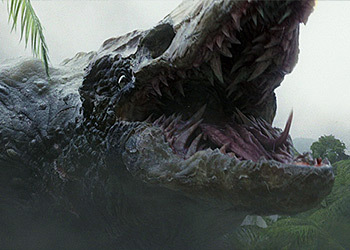 To help facilitate this appetite, the Skullcrawlers could even dislocate their jaws in order to consume large objects. Although primarily located on the east side of the island, congregating at a boneyard nicknamed the "Valley of the Fallen Gods", the creatures also ventured all throughout the island in smaller groups in search of food. 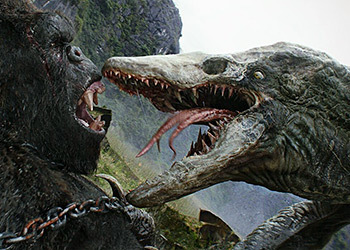 This would often entail other animals on Skull Island or the natives, the Iwi. However, in 1944, the island would be visited by outsiders. In the midst of World War II, a pair of fighter planes were shot down. One pilot was American, Hank Marlow, and the other a Japanese Zero pilot, Gunpei Ikari. Despite an initial skirmish, the two eventually became friends and came to live with the Iwi. They learned of the subterranean terrors on the island, and it was Marlow who dubbed the creatures the Skullcrawlers, named after their distinctive "skull-like" front of their head. Decades passed and, unfortunately, Ikari was killed by the creatures. As Marlow secured his friend's sword, a much larger group of outsiders was about to venture to the island in 1973. This new group came to explore the island. Members were made up of Monarch personnel, a military unit called the Sky Devils, Landsat employees, a photojournalist and a tracker. Initially attacked by King Kong, the group became scattered while suffering heavy causalities. During this commotion, the Skullcrawlers became more active. Two smaller members of the species attacked and killed a Sker Buffalo, with one proceeding to feast on the giant mammal. However, the Skullcrawler was confronted by King Kong. The huge ape was assaulted, though, from the second, hidden Skullcrawler. Despite being outnumbered, Kong easily beat both Skullcrawlers, slamming them to the ground and crushing one of their heads under his foot. Elsewhere on the island, Sky Devils' member Jack Chapman ran into a Spore Mantis. The giant insect was not alone, though, as a Skullcrawler was also stalking nearby. The reptile ambushed and devoured Chapman. Having gorged, the monster returned toward the east side of the island. Meanwhile, the survivors, Marlow among them, reconvened near a river. The colonel of the Sky Devils, Preston Packard, revealed his intention to save Chapman, unaware of his demise. His quest, which roped in the other survivors, took the group toward the "Valley of the Fallen Gods". There the survivors found a huge boneyard, comprised of past kills from the Skullcrawlers. This included giant Kong bones and the remains of dinosaurs, such as a triceratops. They also encountered the smaller Skullcrawler that killed Chapman, which regurgitated the soldier's remains in front of them. This led to a battle between the reptile and the survivors, claiming the lives of many. The slithering creature shrugged off gunfire and even a blade wound as he chased them in the area, although was halted momentarily by a flamethrower. Engulfed in flames, the reptile eventually lashed out with its tail, sending the Sky Devil member with the flamethrower to their demise. The activity, however, awoke a large flock of Leafwings living in the boneyard. Taking to the sky, the creatures attacked the survivors as the Skullcrawler continued to wreak havoc. The beast was stopped, though, after Mason Weaver, a photojournalist, threw her lighter into one of the subterranean holes, causing the gas in the vent to ignite which killed the Skullcrawler. Later that night, the group of survivors became splintered over those who wanted to kill Kong and those who wanted to save the giant ape. The group who wanted Kong dead, led by colonel Packard, set up a trap for King Kong. The plan ignited the great ape, who survived the attack but was greatly weakened. Unfortunately, another Skullcrawler emerged from the nearby water. This member of the species was gigantic, and quickly beat King Kong. The reptile then gave chase to the survivors, leaving behind the giant ape. As the sun rose, the huge Skullcrawler eventually caught up to the remaining humans. One member, Earl Cole of the Sky Devils, attempted to buy the others some time by grabbing some grenades and sacrificing his life. The noble effort was thwarted, though, as the mammoth reptile sent the soldier flying far away with a quick lash of its tail. The giant reptile then cornered the other survivors, although was interrupted as Kong leapt in, boulder in hand which he slammed into the Skullcrawler's face. The two giants then proceeded to duke it out, with the large reptile going for Kong's jugular. Grabbing the Skullcrawler's jaws, though, Kong nearly snapped them before the two untangled from each other. The two monsters then continued to fight in close quarters until Kong got caught up in the chains from a nearby sunken ship. The Skullcrawler proceeded to gloat over his trapped enemy, licking the ape's face until he was distracted by gunfire from the humans. Running off to kill the humans, Kong began to break from his chains. Before the Skullcrawler could engage the survivors, though, one of them fired an explosive flare into the reptile's right eye. The resulting explosion destroyed the eye, leaving the creature with one to see. Kong seized the opportunity of having his foe distracted by using the chain and a propeller to attack. Tossing the propeller, Kong impaled the Skullcrawler, and then used the chain to reel in the reptile. The giant ape then used the chain to choke the Skullcrawler while viciously attacking its jaw, incapacitating the beast. As Kong went to save one of the survivors, Mason Weaver, who fell into the water, the Skullcrawler awoke and continued to attack. 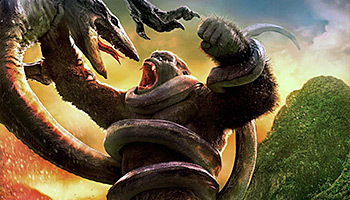 The giant reptile focused its efforts on Kong's hand, which was being used to protect Weaver. Kong eventually gave in, allowing the subterranean creature to bite down on the hand. However, the giant ape rammed the hand down the Skullcrawler's throat and then violently ripped it out, taking with it the monster's tongue and vital organs. This ended up killing the beast as a result. The creature was able to launch its tongue, like a frog, at opponents. It could then wrap and constrict the tongue around enemies. This attack was used by the smaller Skullcrawlers against the soldiers, grabbing them and dragging them into its mouth. It was also used against Kong to restrain the monster's arm. The snake-like body of the Skullcrawler could be used to constrict and incapacitate prey. This feat was used several times by the larger Skullcrawler against Kong during their final skirmish. It allowed the reptilian creature to lock the giant ape in its grasp while continuing to attack with its claws and mouth. 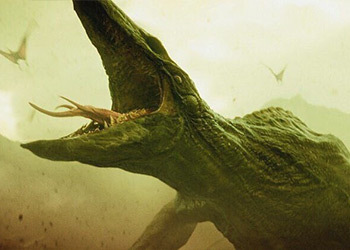 In promoting the movie, Warner Bros. Japan released stats surrounding the monsters of Skull Island. This included the Skullcrawler's length and weight ranges. The length range is 3.65-28.95 meters, although this is believed to be incorrect and actually the monster's height. The reason being that the cryptozoology entry states the creatures height as 12-95 feet, which is comparable to these stats. It also lists the monster's length at 35-194 feet, which is much larger then the length ranges mentioned. 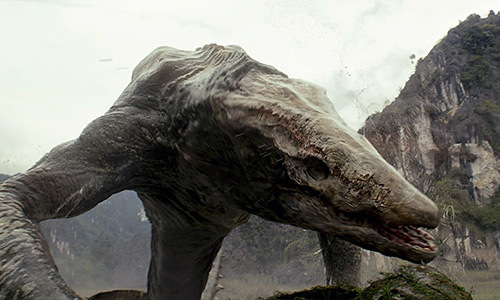 The distinctive "skull-like" look to the character was suggested by director Jordan Vogt-Roberts. The director was actually inspired by the design of the Pokémon Cubone for this, who appeared prominently in Pikachu's Vacation which screened with Pokémon: Mewtwo Strikes Back (1998). This detail is mentioned in coverage by Wired.